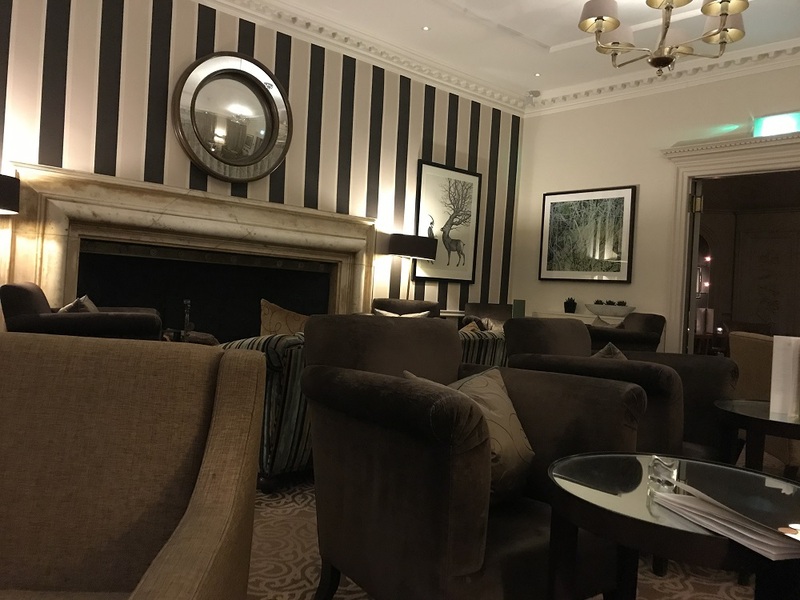 We were delighted to be invited to review Sopwell House and Spa for a short break especially as it coincided with my birthday! Sopwell House was built in the 17th century and is now used as an elegant hotel and has a spa facility for guests and visitors. A quick trip around the M25 from South West London saw us at St Albans in just over the hour. The drive was worth it to be greeted by the elegant Grade II listed Sopwell House in a country setting. 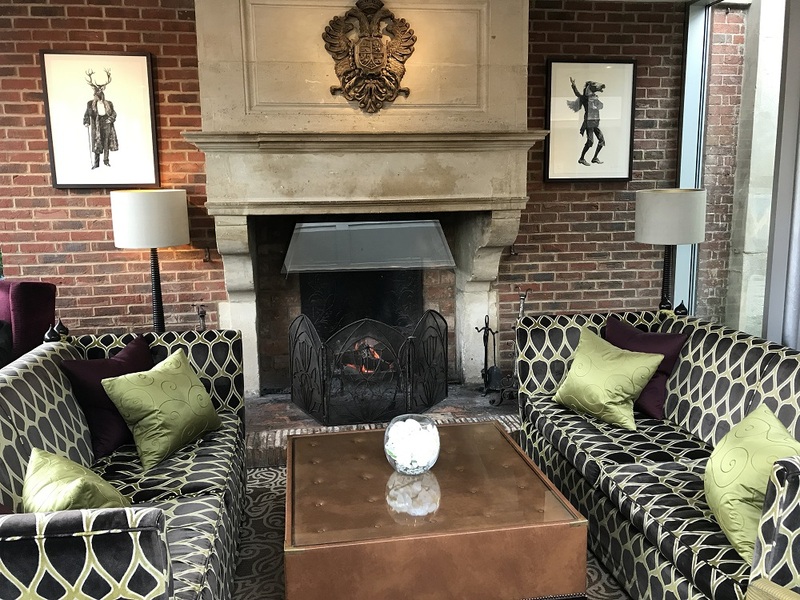 As we walked into the entrance we received a warm welcome by a roaring fire in the imposing fireplace and by the hotel’s reception staff and manager who were expecting us and couldn’t be more helpful in explaining all the facilities on offer. This is always a good sign and we were keen to see more. 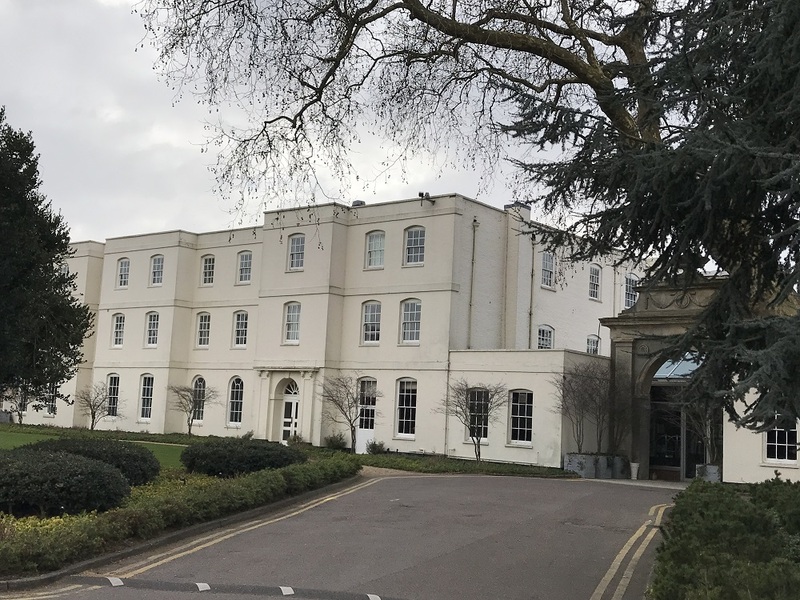 Having come late to ‘The Crown’ (which is now addictive viewing,) I was fascinated to learn the connection Sopwell House has with the Royal Family. The house was Prince Louis of Battenberg’s family home. He had four children including Louis, the youngest, who like his father, had a distinguished Royal Navy career. He became the last British Viceroy of India as Louis Mountbatten, 1st Earl Mountbatten of Burma. Alice, his sister, married Prince Andrew of Greece and their son is Prince Philip, Duke of Edinburgh, who was very close to his uncle Louis. We were shown to our executive room which had a stunning view of the grounds. There are a range of rooms according to your preference and purse. I may have mentioned when arranging the trip that it was my birthday! 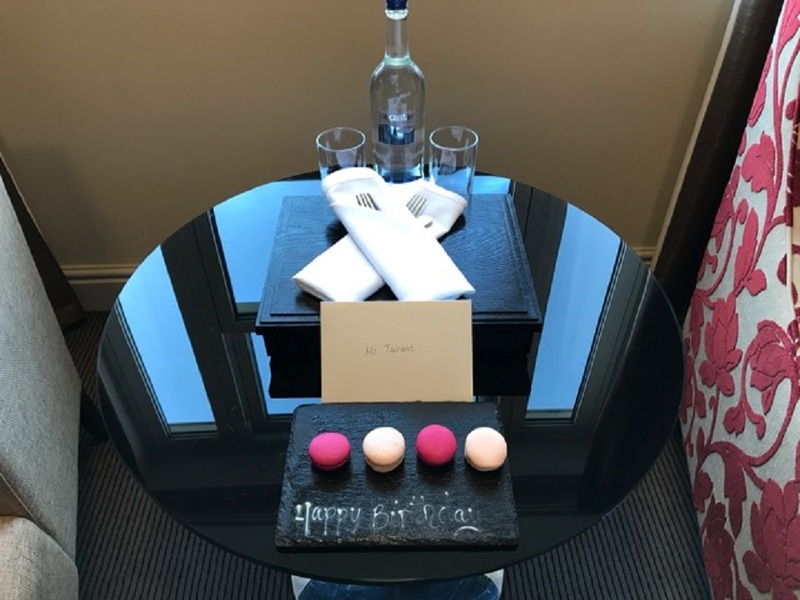 So it was a lovely touch to see the table with a slate plate iced with ‘Happy Birthday ’ and some macaroons. 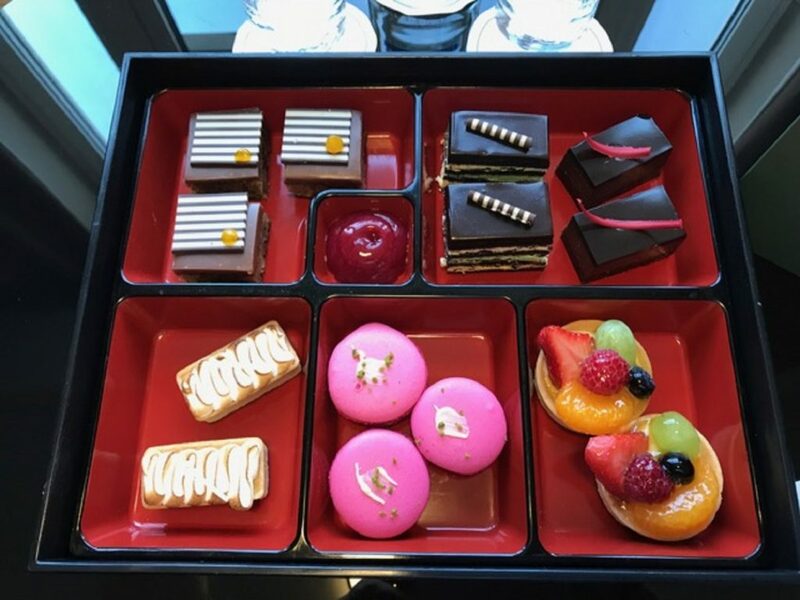 I then spotted a wooden box on the table and when I lifted the lid discovered an array of petit fours. We couldn’t resist and had to sample some, even before our workout in the gym! They were delicious. After unpacking (or rather hanging up the dress for the evening) we got ready to visit the spa. As would be expected in a quality hotel we had complimentary robes and slippers to use in the spa and towels provided in the gym and changing rooms. Sopwell House has a good size gym for a hotel. 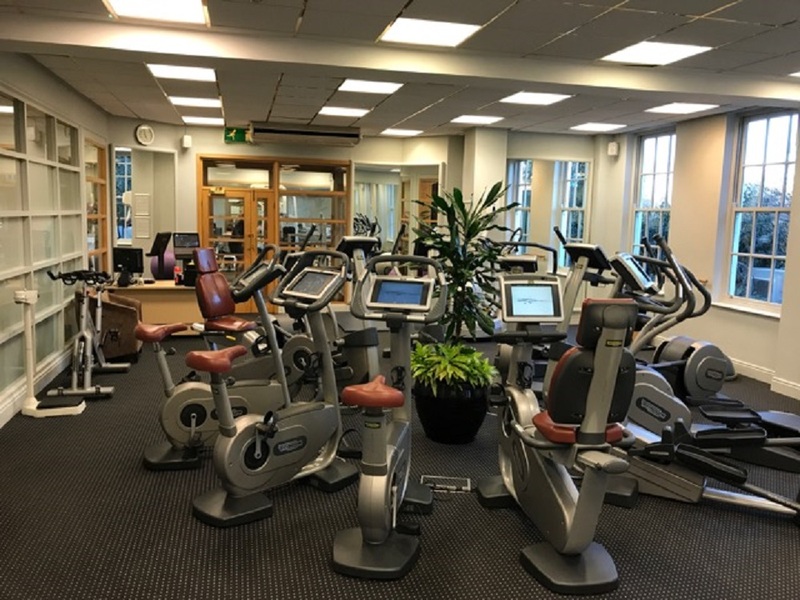 There are two rooms, one with weight machines and free weights and the other with cardio equipment. 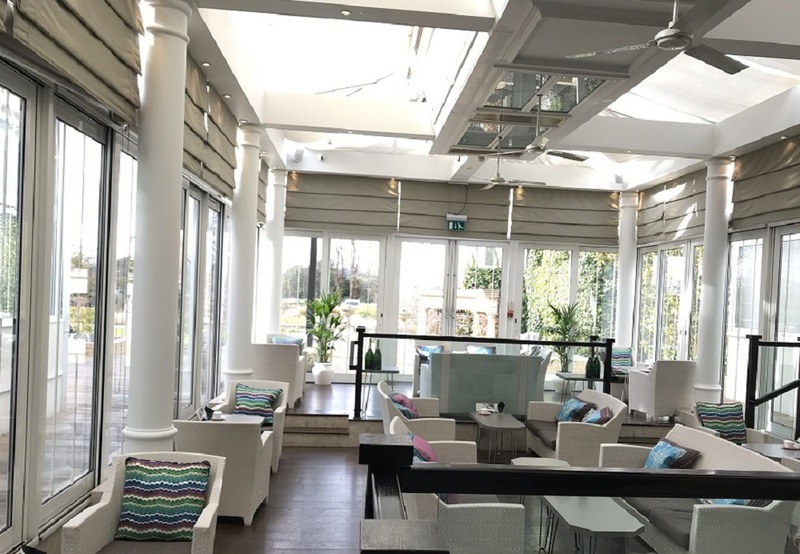 The highlight is the Spa area which consists of an indoor pool under an arched ceiling with stars and surrounded by loungers, a jacuzzi, steam and sauna and a heated tiled seating area. The sauna was particularly good as it was glass fronted looking out over the pool which meant the sauna didn’t have the normal slightly ‘shut in’ feel. As it was Winter we didn’t experience the outdoor areas which looked to have a terrace and attractive gardens. 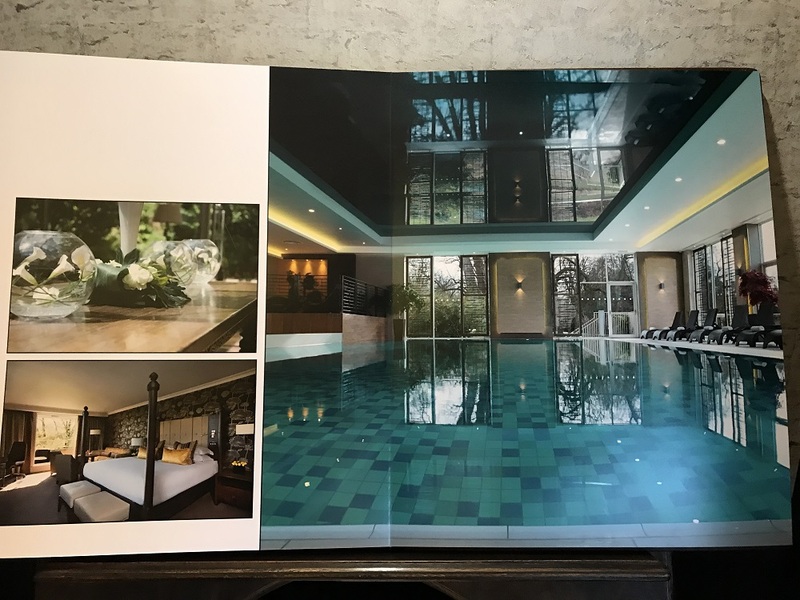 There are currently building works outside (no impact on the inside) to extend the Spa substantially including an outdoor pool so it will be even more fabulous. 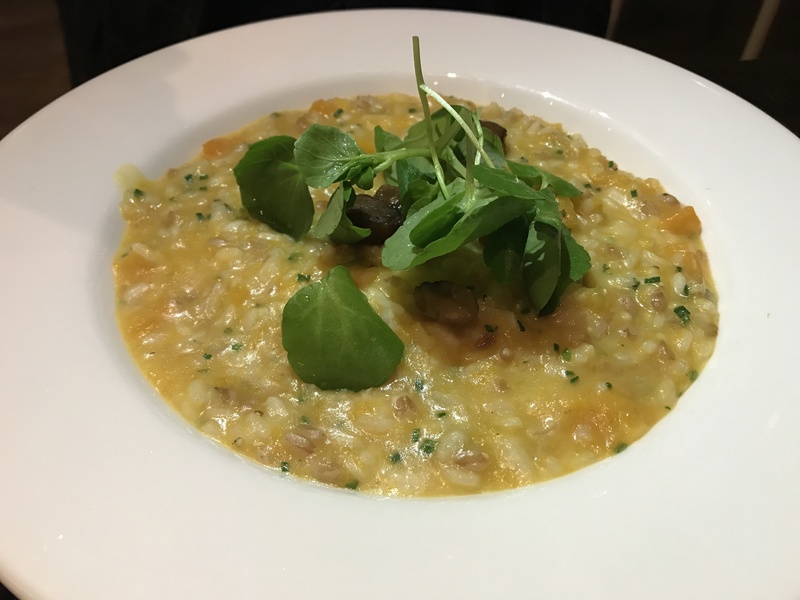 Sopwell House has a fine dining restaurant which London-Unattached has already reviewed, but as part of the spa package, we dined in the Brasserie. Given this was a Sunday evening we were pleasantly surprised by the lively atmosphere. 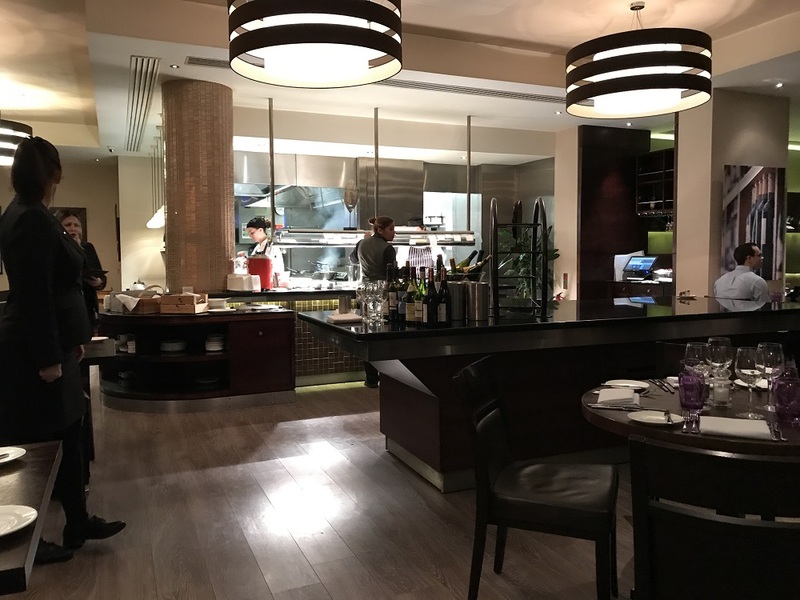 The brasserie is built around an open kitchen area where the chefs were on display and we could hear the call of ‘service’ as the finished plating up the food. The spa package includes a three-course dinner and there is a full selection to choose from. I was impressed that the menu was carefully but discretely coded so that a whole range of food intolerances were catered for, from celery to sulphur dioxide! A plus for a vegetarian and a gluten-free diner. As a birthday treat, I started with a glass of Tattinger and the Veggie Man had a Meantime pale ale. We were offered a selection of breads including some gluten-free options which enabled me to choose the haddock pate starter. 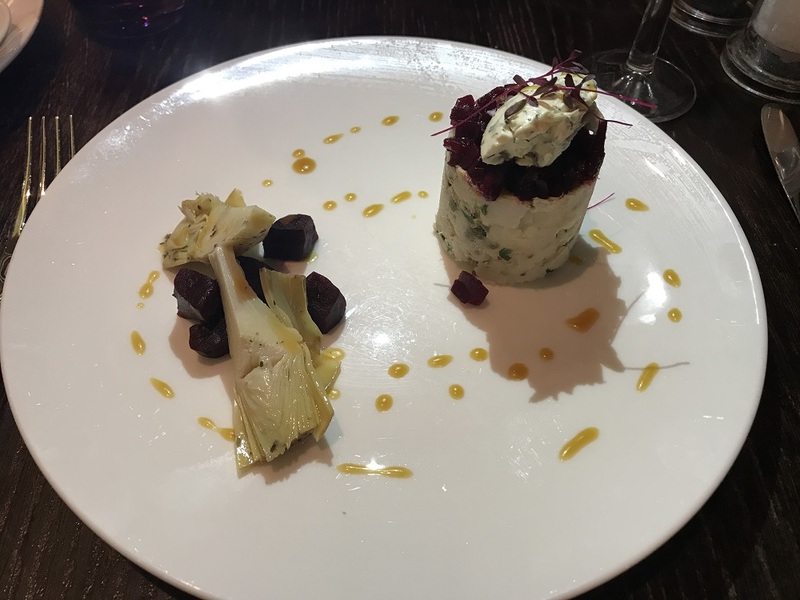 My pate was beautifully presented in a tower of light creamy pate topped with beetroot accompanied with artichoke and beetroot cubes. The Veggie Man had Leek and Mushroom Soup, a rather unusual combination, which was really tasty and warming. 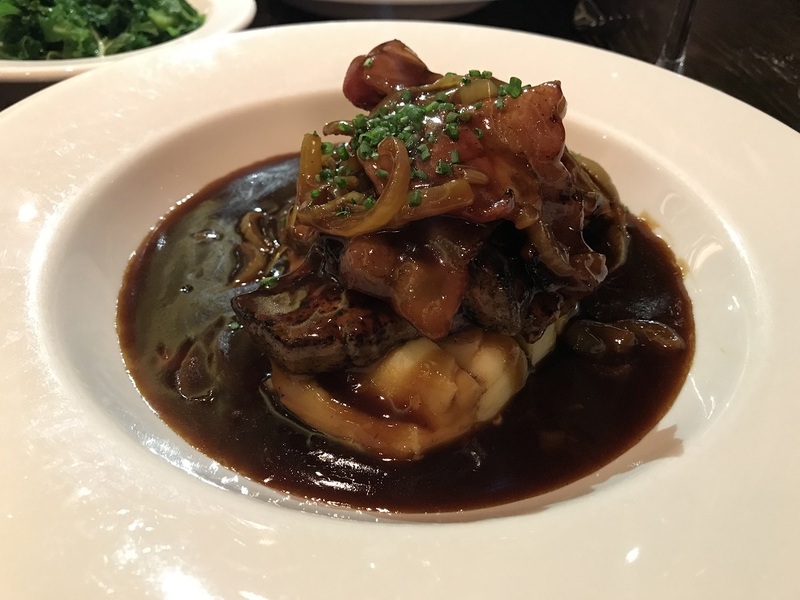 For my main dish, I ordered the calves liver and bacon. An unusual choice on a special occasion. I always think it’s a test of a good kitchen if they can prepare this well so that it is both good comfort food and yet still pleasing to the eye and taste buds. The Veggie Man only had a choice of two mains of spinach and ricotta rigatoni or butternut and spelt risotto. Both were appealing but he went for the risotto which was rich and creamy. There was more of a selection of starters so those veggies looking for more variety could always go large on one of these. To accompany our meal we choose a Rioja Reserva from Vena Pomal which went down a treat. 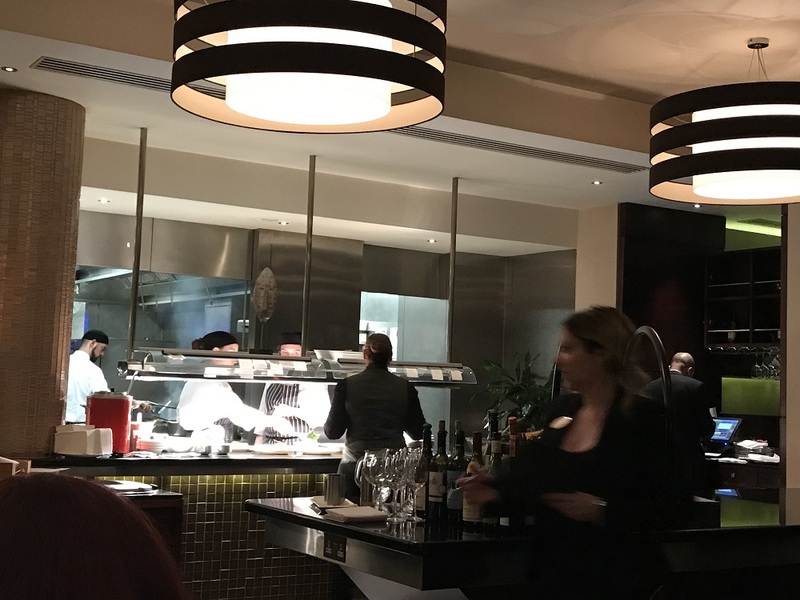 We spotted three real favourites on the list and were impressed by the extensive and reasonably priced wine list. Dessert is always more of a challenge for the gluten-free diner and unfortunately, the only choice labelled GF was ice cream. 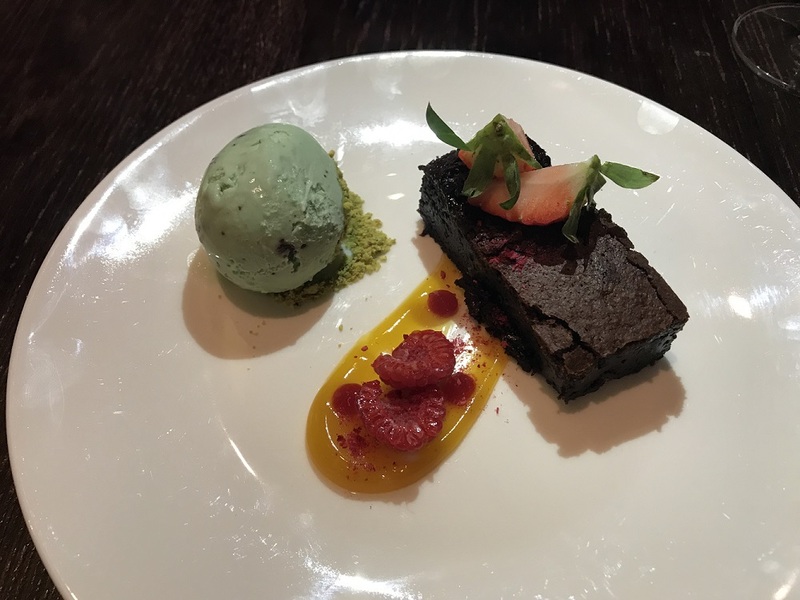 But the team at Sopwell House came up trumps though with a brownie with the mint choc ice cream, pistachio crumb, raspberries and a mango sauce. Being more of a Cheese and Wine fan the Veggie Man had the cheese plate as he still had some wine to finish off. 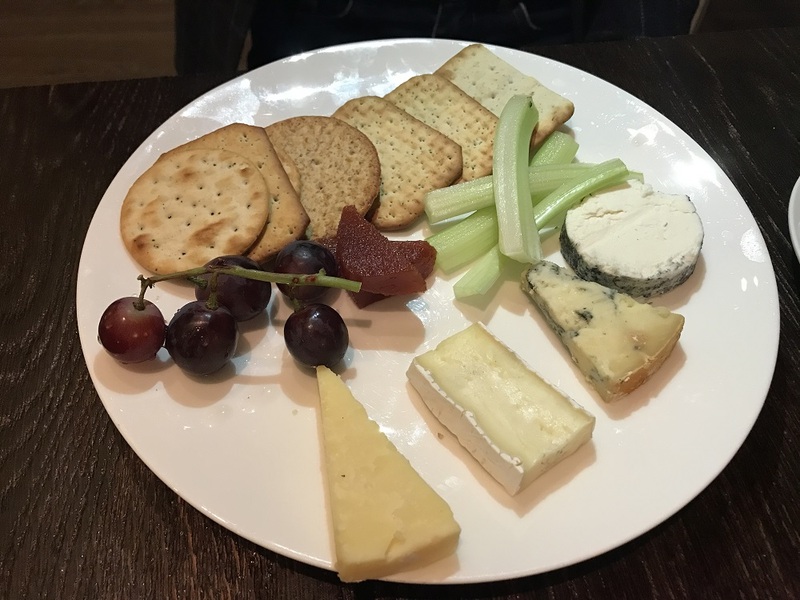 A good selection of cheese was served along with a range of crackers, grapes, celery and jelly accompaniment. Earlier in the evening, the waitress had asked our names when she introduced herself. She also enquired who was celebrating their birthday. She was rather surprised when I said both as ours are just two days apart. So, at the end of the meal, it was a lovely touch when we were served a mini crème brûlée and a chocolate mouse both with candles in. It’s the little extra touches that make all the difference to one’s experience of a restaurant and hotel. After dinner, we retired to the cocktail lounge which was like a classic country house with an elegant, modern twist, rather like the rest of the hotel. We finished the evening off with a decaf coffee and a nightcap. Earlier we had seen the lounge full of guests enjoying afternoon tea so it’s clearly a versatile space. After a good night’s sleep in a massive and comfy bed, we awoke to snow flurries and a frozen pond outside our window. We were warm and cosy inside and so it shows Sopwell House is a great place all year round. I just realised that in some spa hotels you have to go out to the spa but here there’s a great advantage since everything is in one building. That way you don’t need to go outside if you don’t want to or the weather is inclement. I’d have loved to explore the grounds but the combination of poor weather and building work wouldn’t have done it justice. Instead whilst the veggie Man hit the gym again I had a leisurely swim and relaxed on a lounger before having an aromatherapy massage. The hotel uses Clarins and Espa products (one of my old-time favourites) so I was pleased to sample their restorative oil for the massage. It was up there with some of the best massages I’ve ever had and included a scalp massage so I was nicely relaxed afterwards. Sadly by now our time at Sopwell House was coming to an end. We did manage to sit in the conservatory with a nice cup of coffee and enjoy the views before making the journey home. We had a thoroughly lovely and relaxing experience. 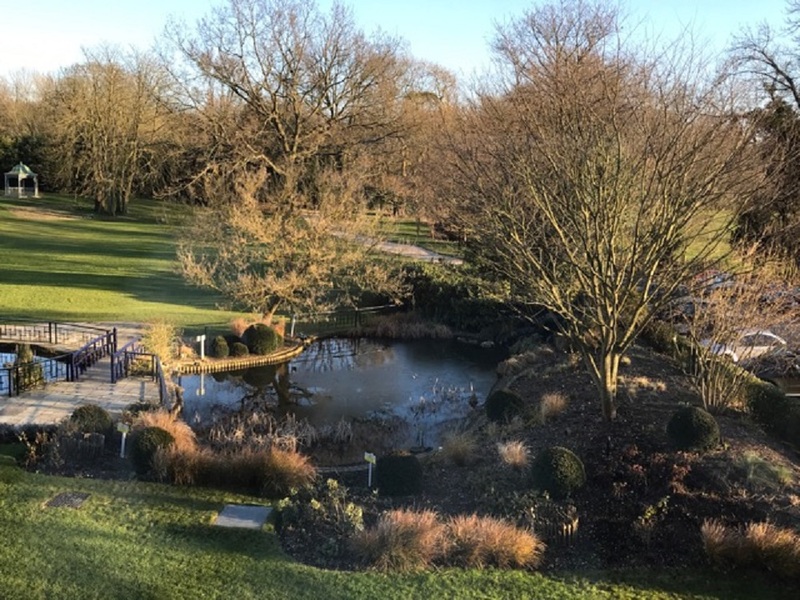 Sopwell House and Spa is ideal for those living in London who want to enjoy a short break in a country setting with a spa without having to travel too far. You can stay in the main house or in the self-catering cottages in the hotel grounds. Sopwell House is also used as a venue for weddings, parties and special occasions. Disclosure: We were guests of Sopwell House and Spa but all content is editorially given. I live in Radlett which is literally down the road from Sopwell House but still have never been and this has made me want to go even more!! What a wonderful birthday trip! Happe belated Birthday too btw! 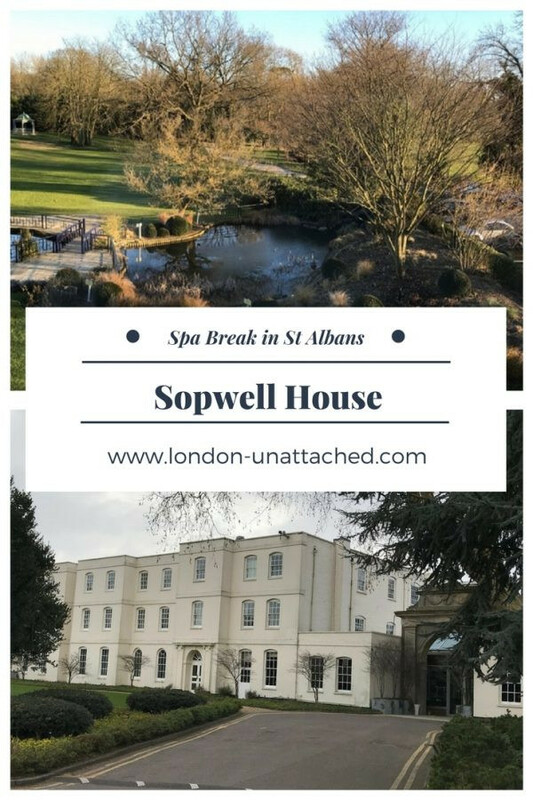 Sopwell House and Spa sounds like a wonderful weekend getaway – I love how they’ve taken the 17th century building and kept it’s traditional charm while offering modern amenities you would find in a regular luxury hotel. And as a royal enthusiast it’s so fabulous to be able to learn about the royal connections behind the estate! The food presentation is absolutely beautiful – noted that a three course dinner comes included with the spa package. 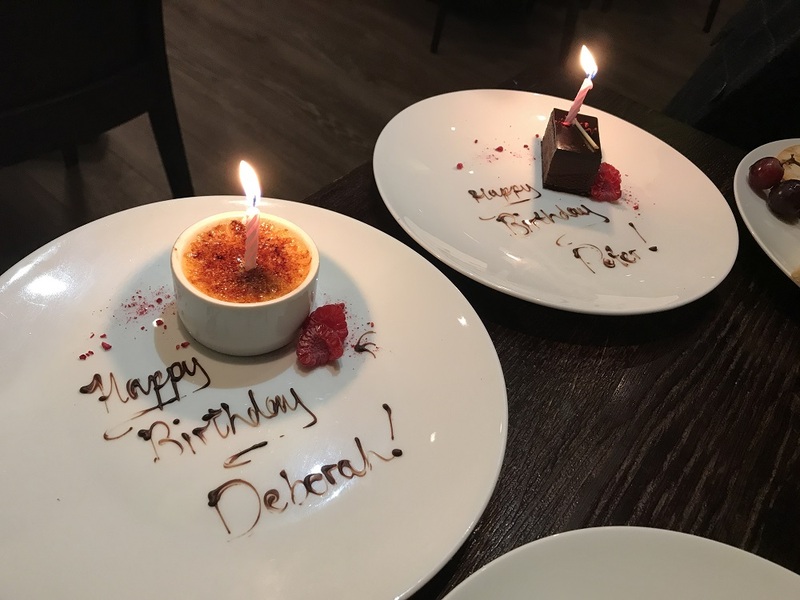 My husband is gluten free so it’s good to know that he’ll be well catered for – and how lovely that they took such notice of your birthday. Lol maybe I’ll have to pretend that it’s mine when we stay :D!